In the field of climatology, 50 years is not much time. Scientists looking for long-term, significant changes in the weather must usually study periods that are much longer than 50 years. The last 50 years have been quite different, however, as we have experienced substantial changes in weather patterns, both in the southwest and nationwide. Regardless of yo ur beliefs about human-caused climate change, if you've paid attention to the weather, you've probably noticed that it has been odd. It is drier than normal and it's getting warmer earlier and for longer periods of the year. According to scientists at the National Oceanic and Atmospheric Administration (NOAA), the average temperature for the contiguous U.S. for 2012 was 55.3°F, which was 3.3°F above the 20th century average and 1.0°F above the previous record from 1998 of 2.3°F. 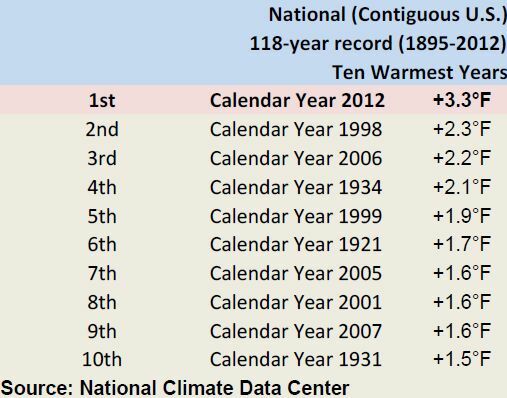 In the last 118 years, eight of the 10 warmest years have occurred since 1990! 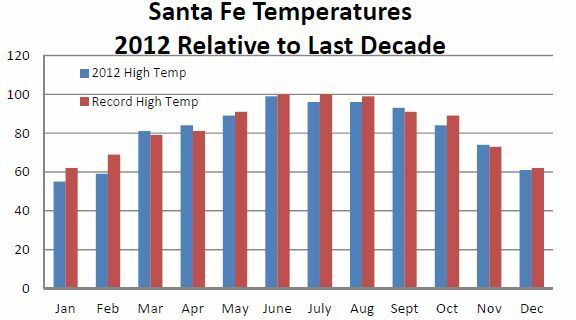 Santa Fe is no different -- our summers have been getting warmer. The year 2012 was one of the warmest on record since records have been kept and this includes the last decade in which our monthly temperatures were consistently above the long-term average. In comparing weather locally over the last decade (i.e. 2003 - 2012) with data from WeatherUnground, the winter was the colder and shorter and four months of the year were the warmest in the last decade. Additionally, three other months were within 2 degrees of the record high. Rising temperatures mean we need more electricity to cool our homes and more water to water our plants. Given the rising costs of both, I highly recommend you start preparing for a drier, warmer climate. Planting trees to shade the west side of the house is a simple yet great way to increase the comfort of our homes during our increasingly warm, sunny, summer days. Slowing changing out our landscape to more drought, heat tolerant plants. Swapping out light bulbs with CFL or LED-type bulbs is another great way to reduce heat inside the house, save electricity and thereby save water. The most likely scenario is for temperatures to continue to go up. As they do, water usage will also go up (i.e. more outdoor watering and water usage by cooling systems increase as temperatures increase). Get an energy audit or a water audit to learn how much energy or water you use and ways you could conserve. As our climate becomes warmer, start thinking about how to stay cool without increasing your overall energy or water "footprint."